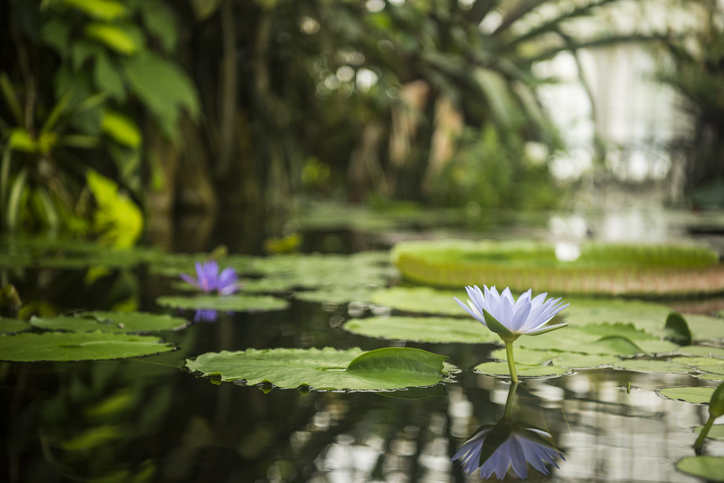 Surround yourself with nature by never leaving the city with a visit to UCLA's Mildred E. Mathias Botanical Garden. The 7.5 acres are free to explore every day, but on the first Saturday of the month, April 6th, you're invited to join a docent for a free guided tour. Surround yourself with nature by never leaving the city with a visit to UCLA's Mildred E. Mathias Botanical Garden. The 7.5 acres are free to explore every day, but on the first Saturday of the month, April 6th, you're invited to join a docent for a free guided tour. You'll hear the storied tales of a number of plants and how they relate to your health and happiness. Group tours can also be arranged separately. Walk from climate zone to climate zone, through ancient forests and subtropical woodlands, wild Western Australian and Mediterranean ecosystems, through Hawaiian blooms and desert cacti. Winding around each is a stream of water-born fauna and flora, including koi and turtles, massive redwoods and banana trees. Enter the garden in the southeastern corner of UCLA's 400 plus acre campus. Walk the school grounds after your tour to learn why California is as smart as it is beautiful! 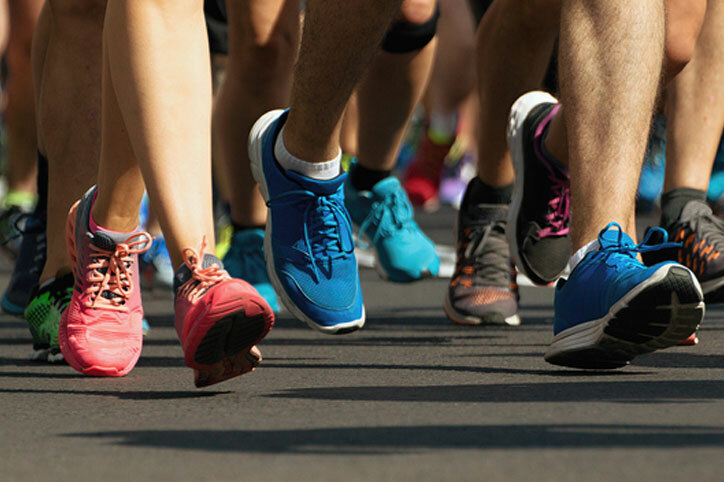 Go ahead, sign up to run the LA marathon March 24th. Thousands of people will join you and some will even stay the night with us! Actually, we're here to encourage you to watch with us. Go ahead, sign up to run the LA marathon March 24th. Thousands of people will join you and some will even stay the night with us! Actually, we're here to encourage you to watch with us. The 26.2-mile course stretches from Los Angeles' Dodger's Stadium across the city to the Santa Monica Pier. That means, in the last mile, runners will turn left to pass directly in front of Hotel Oceana so they can run mile 26 along Ocean Avenue. It couldn't be easier to be a fan. In fact, given the number of road closures city-wide, staying put may, in fact, offer your path of least resistance. But if you want to get out and about, check out the Finish Festival on Santa Monica Blvd between 2nd St and Ocean Ave. It's home to the Angel City Brewery Beer Garden, live music, and entertainment for the whole family. Come to LA and let the city run to you! Santa Monica is your ticket to looking and feeling your summer best this winter! Especially after a visit to Bulletproof Labs, where it's their mission to help you perform better, think faster and live happier. Santa Monica is your ticket to looking and feeling your summer best this winter! Especially after a visit to Bulletproof Labs, where it's their mission to help you perform better, think faster and live happier. Think of it as a workout of the future and for the future with cutting-edge technology dedicated to biohacking. In Bulletproof's words, that means changing your external and internal environments in order to gain full control of your biology and facilitate an upgrade to body, mind, and life. How is this possible? Their methods include cryotherapy, infrared light therapy, bone, and atmospheric cell trainers as well as a "Cheat Machine" that gives you a week's worth of weight lifting in fifteen minutes. Find balance in the brain with a virtual float tank and meditative offerings for deep relaxation and clarity. Sound crazy? 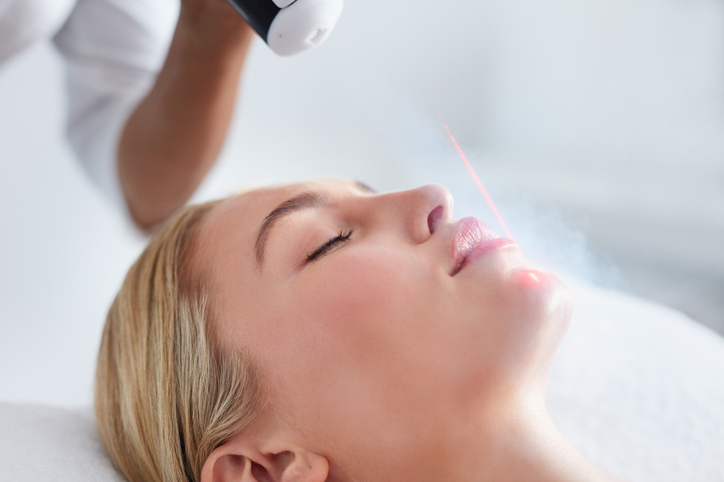 If you have your doubts, stop in for a complimentary consultation. Oceana is happy to announce we're making something great even better. During the winter months through April 1st, we're undergoing a $20 million dollar transformation. It's our goal to make your home away from home as bold and stylish as ever while offering supreme comfort and hospitality. Oceana is happy to announce we're making something great even better. During the winter months through April 1st, we're undergoing a $20 million dollar transformation. It's our goal to make your home away from home as bold and stylish as ever while offering supreme comfort and hospitality. 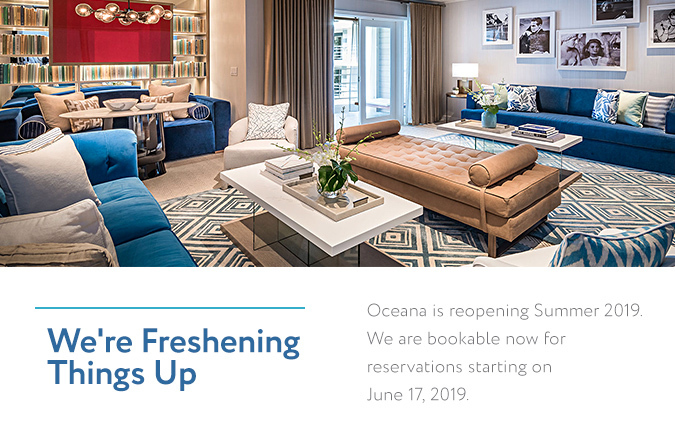 It's been our mission since the 1950s when Oceana boasted its status as "California's newest apartment hotel" and became a crowd favorite for its ocean-view balconies, televisions and maid service. Our new look will hold strong to its vintage roots and up the ante with hand-crafted rugs from Nepal, deluxe bedding, artwork by local masters, and luxe bath products. Outside, a revamped pool area will include a new dining pavilion, fire pit, and furniture you'll not want to get out of. All charm and class, we hope you'll feel the ease of our breezy new swagger and feel more comfortable than ever to call us home. Still without a photo for this year's holiday card? Look no further than PORTALS, A Photo Experience from Canon on the Third Street Promenade in Santa Monica. Still without a photo for this year's holiday card? Look no further than PORTALS, A Photo Experience from Canon on the Third Street Promenade in Santa Monica. The free event opened November 29th and lasts through December 16th. It's a hands-on photography pop-up that puts a new spin on Instagram-able moments by giving you a full selection of Canon cameras. This includes EOS R, Canon’s first full-frame, mirrorless camera. Don't know how to use it? Don't worry! On-site camera experts will teach you all the tips and tricks you'll need to manipulate the expensive glass and capture one-of-a-kind shots through psychedelic perspective, buzzing neons, and total saturation. You'll also have the chance to win some free gear and sign up for walk-throughs and workshops should you want to learn more. The Promenade location features six unique backdrops for you to choose from. PORTALS will be open to the public Monday through Friday from 3-9pm, Saturday 12-9pm, and Sunday 12-8pm. Don't miss out! Pack your bags (or at least a bagged lunch) for a seismic scavenger hunt. On November 17th, California seismologist Stan Schwarz and research geophysicist Morgan Page welcome you aboard their coach for a 'faulty' adventure to see all the rifts and shifts that have pulled much of Southern California apart. Pack your bags (or at least a bagged lunch) for a seismic scavenger hunt. On November 17th, California seismologist Stan Schwarz and research geophysicist Morgan Page welcome you aboard their coach for a 'faulty' adventure to see all the rifts and shifts that have pulled much of Southern California apart. Your journey will start at the Caltech Seismological Lab where you'll tour the media and public notification center. Later you'll get to peer into the Antelope Valley at the San Andreas Fault line. Elsewhere your guides will give you exclusive insight into new and active faults. But don't be fooled. What may look like a lake is actually a pool of water trapped within a sunken patch of land between two fault lines. Smack in the middle of the desert, where does the water come from? Your trusted guides will have all the answers! Contact Atlas Obscura to reserve your seat. For us, Halloween summons images of creative costumes, epic parties, loads of candy, and our favorite creepy movies. We’re betting you feel the same, so we’re listing a couple of our favorite places for film features, along with a heads-up about an incredible Halloween gathering. For us, Halloween summons images of creative costumes, epic parties, loads of candy, and our favorite creepy movies. We’re betting you feel the same, so we’re listing a couple of our favorite places for film features, along with a heads-up about an incredible Halloween gathering. First, head over to the Rooftop Cinema Club, with its fabulous film selections, comfy chairs, wireless headsets, snacks, adult libations, and an impressive city view. October’s lineup includes John Water’s cult classic, “Cry-Baby,” the hilarious “Waiting for Guffman,” and Kubrick’s masterpiece, “A Clockwork Orange,” along with many of our Halloween favorites through October 31. Horror aficionados won’t want to miss “Alien,” the double bill of “Hocus Pocus” and “The Witches,” and, naturally, “Halloween.” And, claim your own oceanside seat for “Films, Food, Drinks, and Fun” at Santa Monica Pier’s Front Porch Cinema. This month’s screenings are “Grease,” “Clueless,” “The Addams Family,” and “Coco.” Lastly, if you’ve never been to the West Hollywood Halloween Costume Carnaval, make plans now to join this epic party on October 31. Known as the largest Halloween street party in the world, the Carnaval’s theme of seasonal exuberance is evident in the costume contests, dancing, drinking, parades, and more. Don’t miss it! Pop quiz: Where is the world’s largest urban national park? If you said Santa Monica, CA, you would be absolutely right. Pop quiz: Where is the world’s largest urban national park? If you said Santa Monica, CA, you would be absolutely right. With over 154,000 sprawling acres of land and some 30 trails ready and waiting for hikers, campers, mountain bikers, and equestrians, the Santa Monica Mountains National Recreation Area is the perfect spot to escape from civilization for a few hours of sublime natural splendor. If you’re up for an invigorating and scenic hike, we highly recommend Los Liones Trail at Topanga State Park, just 10 short minutes from our hotel. The trail won’t look like much when you first enter, but after a brief walk, you’ll find yourself in a verdant thick of foliage and shade. Continue for just over a mile till you reach East Topanga Fire Road, which affords stunning views of Santa Monica Bay. Then, for an even more inspiring panorama, proceed up the sharp incline into the State Park proper, where you’ll be able to look down on the Pacific and out onto the majestic San Bernardino Mountains. As a child, did you imagine the bliss of wandering the Rainbow Road through Candyland Kingdom? Did you dream at night of joining Willy Wonka in pursuit of everlasting gobstoppers and gushing chocolate fountains? As a child, did you imagine the bliss of wandering the Rainbow Road through Candyland Kingdom? Did you dream at night of joining Willy Wonka in pursuit of everlasting gobstoppers and gushing chocolate fountains? Now through July 4, your childhood dreams can come true at Candytopia, an interactive, multi-room art installation that will immerse you in more than a dozen unique candy-clad settings. Just a short 10-minute drive from our hotel, Candytopia is housed on the second floor of the Santa Monica Place Mall. On your hour-long tour through this confectioner’s dreamscape, you’ll encounter “colossal candyfloss constructions” bedecked with “flying unicorn pigs," marshmallow chandeliers, and much more. In addition to the vibrant visuals and tantalizing aromas, you’ll also be invited to taste the wares as you are guided from room to room. The perfect outing for kids or adults who are kids at heart, Candytopia truly is a world of pure imagination. If we were compiling a list of the Seven Wonders of the Americas, the Grand Canyon would certainly be near the top. In recent years, however, this iconic geological formation has been increasingly threatened by human development. If we were compiling a list of the Seven Wonders of the Americas, the Grand Canyon would certainly be near the top. In recent years, however, this iconic geological formation has been increasingly threatened by human development. In an effort to document the sublime beauty of the canyon and educate the public about challenges to its existence as we know it, acclaimed photographer and filmmaker Pete McBride spent a year hiking more 700 miles through Grand Canyon National Park. On the evenings of Thursday, March 15, and Friday, March 16, Pete and his collaborator, travel-writer Kevin Fedarko, will be unveiling their film The Canyon at The Broad Stage theater’s main stage, the 499-seat performance arts venue right here in Santa Monica. This ticketed event, which is jointly sponsored by National Geographic and The Great Courses and Grand Canyon Trust, is sure to thrill both nature and documentary-film enthusiasts. Famous for its world-class aquarium, nearly century-old carousel hippodrome, and iconic solar-powered Ferris wheel, the Santa Monica Pier is a premier destination for good eats, casual shopping, and live entertainment. Famous for its world-class aquarium, nearly century-old carousel hippodrome, and iconic solar-powered Ferris wheel, the Santa Monica Pier is a premier destination for good eats, casual shopping, and live entertainment. On Friday, February 16, the pier will host a special, experimental theatrical event, An Illegal Start, an original stage production by acclaimed playwright James Harris, brought to you by the Santa Monica Public Theatre. The play follows the trials and tribulations of a pair of young men who unexpectedly become friends after a terrible accident leaves them both badly shaken and in need of sanctuary, which they discover in an old, dilapidated amusement park. By turns hilarious and heart-rending, this show will change the way you think about the spaces we inhabit and the many roles each of us performs (or fails to perform) in our day-to-day lives. When you were a teenager, did you keep a diary? Have you read that diary lately? What if you had to read it in front of a room full of strangers—strangers looking for a good laugh? When you were a teenager, did you keep a diary? Have you read that diary lately? What if you had to read it in front of a room full of strangers—strangers looking for a good laugh? It sounds absolutely mortifying to us, but also potentially very funny. And it’s exactly what two intrepid souls do every third Wednesday of the month at the Improv Diary Show, where a cast of nine seasoned improvisers take these candid adolescent musings on training bras, lunch room antics, unrequited crushes, first kisses, and last dances as inspiration for a hilarious and often poignant one-hour performance. The next show goes up at 8 P.M., Wednesday, January 17, at the Westside Comedy Theater. Not available on Wednesday night? Not to worry, the theater hosts a variety of improv, sketch, and stand-up comedy shows to delight patrons seven days a week. Santa Monica might not be the number one spot for a white Christmas, but if you’re not a fan of wearing seven layers and tunneling your car out from beneath massive snow drifts, then you’ve found the right place to spend December. Santa Monica might not be the number one spot for a white Christmas, but if you’re not a fan of wearing seven layers and tunneling your car out from beneath massive snow drifts, then you’ve found the right place to spend December. Even with our mild winter climate, guests of the Oceana Beach Club can still partake in some classic winter pastimes, including a foray out onto the ice. From now through January 15, you can enjoy ICE at Santa Monica, located at the corner of 5th Street and Arizona Avenue. The 8,000-square foot ice skating rink is a great place to have fun (and get some novel exercise) with friends, family, or that special someone. Bring your own skates, or rent a pair for the day. Perfect for beginners and longtime skating enthusiasts, ICE at Santa Monica provides all the joy of winter without any of the inconvenience. From its perch on Mount Hollywood, the Griffith Observatory enjoys breathtaking views of Hollywood, downtown L.A., and the Pacific Ocean. But of course, what keeps tourists coming back to the observatory year after year is not what’s below, but what’s above. From its perch on Mount Hollywood, the Griffith Observatory enjoys breathtaking views of Hollywood, downtown L.A., and the Pacific Ocean. But of course, what keeps tourists coming back to the observatory year after year is not what’s below, but what’s above. The Zeiss telescope, the coelostat telescope, and multiple mobile telescopes offer visitors the opportunity to gaze at the planets, sun, and distant stars. Public star parties, where qualified astronomy enthusiasts are on hand to help newbie stargazers with the outdoor telescopes, are held one Saturday per month. Indoors, the state-of-the-art Samuel Oschin Planetarium, unmatched anywhere in the world, can comfortably seat 290 spectators for one of three shows, Centered in the Universe, Water is Life, and Light of the Valkyries, each of which is narrated by a dynamic, live storyteller. In addition, the observatory hosts a wide range of daily lectures and panel discussions year round. A fun and informative outing for both kids and adults, the Griffith Observatory is one California experience that will make you glad to live in this wondrous 21st century. If you love to laugh as much as we do, then you have to check out Bear Supply, ranked among “The 100 Best Things in Comedy” last year by The Comedy Bureau. If you love to laugh as much as we do, then you have to check out Bear Supply, ranked among “The 100 Best Things in Comedy” last year by The Comedy Bureau. Combining sketch and long form improv, this top-notch comedy ensemble has also been featured at the Miami Improv Festival, the Las Vegas Improv Festival, and the SF Sketchfest. Here in Santa Monica, Bear Supply performs every other Wednesday at 9 P.M. at the Westside Comedy Theatre, located less than a mile from the Oceana Beach Club Hotel. If you’ve never seen long form improv, it’s not a bunch of Whose Line style short games. With an initial suggestion from the audience, it weaves complex narratives that can be as poignant as they are hilarious. Masters of the genre, Bear Supply brings a live DJ and a unique energy to every one of its uproarious shows. Since 1981 American Cinematheque has devoted itself to preserving and promoting the best of classic and cult film to the viewing public. The Cinematheque operates two venues, the Egyptian Theatre in Hollywood and the Aero Theatre right here in Santa Monica. Since 1981 American Cinematheque has devoted itself to preserving and promoting the best of classic and cult film to the viewing public. The Cinematheque operates two venues, the Egyptian Theatre in Hollywood and the Aero Theatre right here in Santa Monica. Big name chain theaters have been known to cut corners: they disregard aspect ratio, use projector lenses ill-suited to the film, ignore acoustic nuance, etc. At the Aero, none of this escapes attention; every detail of your movie-going experience has been planned with painstaking care. Special screenings for the month of September include a tribute to the great French actress Jeanne Moreau, with double feature La Notte (Antonioni) and Diary of a Chambermaid (Buñuel), movies adapted from the work of master horror writer Stephen King, with The Shining, Carrie, and Shawshank Redemption, and a selection from auteur Stanley Kubrik, with The Paths of Glory, The Killing, and Dr. Strangelove. Named for the Los Angeles to Santa Monica trolley stop that once occupied the site, Bergamot Station Arts Center is comprised of more than forty art galleries and the Santa Monica Museum of Art. Named for the Los Angeles to Santa Monica trolley stop that once occupied the site, Bergamot Station Arts Center is comprised of more than forty art galleries and the Santa Monica Museum of Art. Each gallery boasts a unique theme and is tended by an expert curator, which means there’s something to suit nearly every art lover's taste in this sprawling industrial complex. And with about 600,000 visitors annually, exhibition space is fiercely coveted by artists across the nation. We particularly recommend Andy Warhol: Revisited at Revolver Gallery, which owns the largest gallery collection of Warhol’s works in the world (for this particular exhibition, you’ll have to make a reservation online before heading over). Bergamot Station also hosts an ever changing list of special events, which you can peruse on their website. If you can, stop by for the Fall Open 2017 event on Saturday, September 9. Food trucks, live music, artist talks, and many new exhibition debuts will pack the day starting at 11 A.M. and running to 9 P.M.
We’ve told you before about the outstanding art exhibits at the Annenberg Community Beach House, but in fact, that’s just one of many attractions that this unique Santa Monica venue has to offer. We’ve told you before about the outstanding art exhibits at the Annenberg Community Beach House, but in fact, that’s just one of many attractions that this unique Santa Monica venue has to offer. Once a beachside mansion belonging Marion Davies, mistress to famed newspaper magnate William Randolph Hearst, this five-acre estate became “America’s Most Beautiful Hotel” in 1947. Now a community center open to all, the Beach House provides many entertaining options for visitors of all ages. You could join a yoga class, or relax playing board games in the game room. If you’re looking for a fun way to exercise, rent a paddleboard and get out on the water, or enjoy a round of volleyball. Tour guides are happy to regale you with the salacious details of the lives of Hearst, Davies, and their many famous friends. You can even swim in the storied pool where Hollywood superstars like Greta Garbo and Clark Gable regularly lounged the day away. After sunset, the pool area is restricted to adults only to give you some quiet time away from the kids. A testament to Santa Monica's desire to cultivate new artistic visions and talent, the Annenberg Community Beach House hosts a year-round rotating exhibition that features the work of local painters, sculptors, photographers, performance artists, artist collectives, and more. Santa Monica continually proves itself as a major incubator for the arts on the west coast. As part of the city’s commitment to cultivating new visions and talent, the Annenberg Community Beach House hosts a year-round rotating exhibition that features the work of local painters, sculptors, photographers, performance artists, artist collectives, and more. Some are giants of their field, some are fresh faces, but they all represent the best of what Santa Monica and greater Los Angeles have to offer. From June 13 through November 6, the newest exhibit, Identity in Los Angeles, will premier the creations of students and instructors at Art Division. The product of meticulous research, these multi-media artworks will explore and attempt to elucidate the concept of identity as it relates to race, ethnicity, nationality, gender, sexuality, age, and more. As the world’s largest urban national park, the Santa Monica Mountains National Recreation Area spans over 154,000 acres and boasts over 30 trails perfect for hikers, mountain bikers, horseback riders, campers, and more. As the world’s largest urban national park, the Santa Monica Mountains National Recreation Area spans over 154,000 acres and boasts over 30 trails perfect for hikers, mountain bikers, horseback riders, campers, and more. If you’re in the mood for a rejuvenating and inspirational hike, we recommend Los Liones Trail at Topanga State Park, located just 10 minutes from our Oceana Beach Club hotel. The entrance isn’t too remarkable, but after a short distance, the trail blossoms into lush greenery and shade. After about 1.3 miles you’ll come to East Topanga Fire Road, where the views of Santa Monica Bay are breathtaking. Continue on for a bit of a challenge as Fire Road rises up a steep incline into the State Park. You’ll soon be treated to awe-inspiring panoramic views of the Pacific Ocean and the distant sight of the San Bernardino Mountains. We recommend that you sit for a few minutes to meditate before heading back to the Oceana for a cocktail followed by a luxurious bath and dinner at Tower 8. Crowd around these fabulous Santa Monica stages before the good tables fill up. Crowd around these fabulous Santa Monica stages before the good tables fill up. This month the mic is hot and the talent off the charts with dangerous satire, quick thinking improv, and enchanting reprisals of family-friendly tales. L.A. Café Plays has been praised for its lightning-fast storytelling, which brings a five short plays to fruition in under a single day’s time. Local celebrities frequently join in! Come to the Ruskin Group Theatre to watch the drama unfold. Join Neal Brennan, who co-created Comedy Central’s hugely successful The Chappelle Show, and the famous folks he calls friends as they try out new material live on the Westside Comedy Theater stage. A kingdom of every child’s favorite fairy tale heroes and villains will grace the stage of the Santa Monica Playhouse. Finding Belle follows Snow White, Little Bo Peep, Cinderella, and Mother goose as they search for ever after. Spring makes its far-flung way across the eastern half of the country. It’s warmer than usual in Santa Monica as spring makes its far-flung way across the eastern half of the country. Change into something lightweight and show your appreciation with an afternoon out of doors. More than 130 years of local history is at your fingertips when you embark on a walking tour of downtown Santa Monica. Led by the Santa Monica Conservancy’s friendly docents, this two-hour tour will talk your family through the city’s Wild West beginnings before ultimately arriving at the modern metropolis of today. Enjoy a close look at the vision Santa Monica’s civic leaders put forward for their growing city, and then size up the downtown district’s architectural splendor, a heritage that includes the Rapp Saloon of 1875. Opened the same year as Santa Monica’s founding, the saloon eventually served as our first city hall. Make a visit to the Conservancy’s website to book your Saturday morning tour. Surprise your valentine this year with the gift of laughter and thrills. Esters should be your first thought when it comes time to phone in the perfect Valentine’s Day bouquet or whip together a box of champagne truffles. Couples can enjoy a special tasting of pink wines ($25 per person) from dry and sweet to sparkling. If you’re not afraid of a little magic, take your valentine to see Steve Spill’s Escape Reality, which features spellbinding acts of levitation, mindreading, optical illusion, and disappearance. Tickets to this month’s performance includes a champagne toast and take-home souvenir. Give your date the gift of a belly laugh with tickets to Mission IMPROVable’s Funny Valentine. This nationally renowned comedy troupe is well versed in tickling funnybones. Every ticket to the show includes complimentary appetizers, plus a beer and wine bar. Give your legs a good stretch with a peaceful walk through sunny Santa Monica. After filling your bellies late into the the New Year, why not give your legs a good stretch with a peaceful walk through sunny Santa Monica. After all, it is Sunday. Santa Monica is said to have one of the best produce on the west coast. See for yourself during a weekly farmers market with live music, plenty of fresh vegetables, and fruit ripe for snacking. Join this eleven o’clock walking tour and learn about the fascinating history of the Pier’s first hundred years. Meet your friendly docent waiting by the Merry Go-Round Building’s Pier Shop. This weekly feature is a favorite for children! Families are invited to show up for an entertaining presentation on saltwater sharks. Peer into their tank and discover what makes them swish.